Looking at the vast world of plastic men and women. I wanted to see if there were Hot Wheels vehicles that would fit in with the scale of MiniMates. Of course, the only vehicles that had a chance of working were the motorcycles vehicles. Since Hot Wheels are made based on size in the packaging rather than actual 1:64 scale, the smaller the vehicle, the bigger the scale when being made into Hot Wheels. First off, Nova is riding the Honda Monkey Z50. A strange bike to be sure. It is a goofy bike, so it looks okay being on the small size. The really nice thing about this bike is that it has flat tires, so it can stand on it’s own. This bike can easily be a background piece to a diorama, and it would fit in just fine. 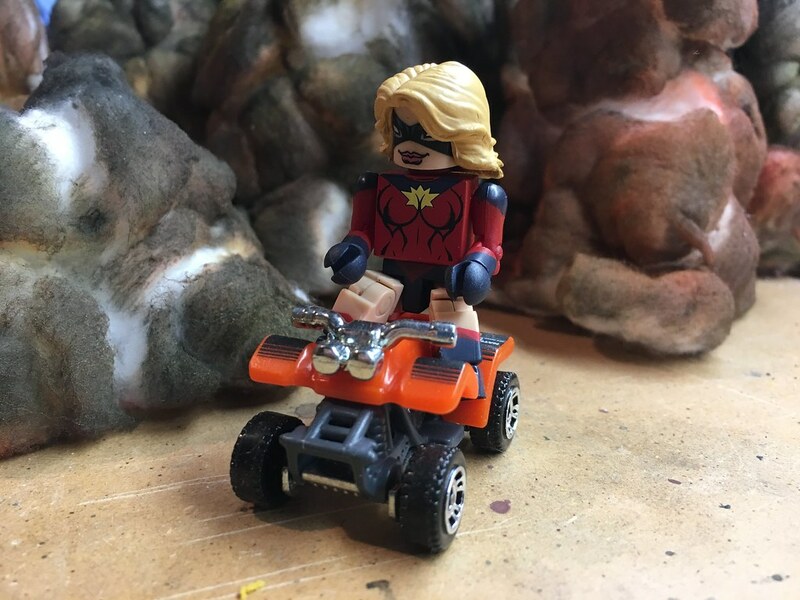 Captain Marvel is riding the 4 Wheeler. This one I was pretty sure was going to be too small, but it was part of a Parks Department set I had, so I figured I would give it a try. It is too small. She can ride it okay, but quad bikes are generally a whole lot bigger than this. Definitely a kid’s size for the MiniMate scale. The UNSC Gungoose from HALO was really the bike that got me thinking about Hot Wheels vehicles working in this scale. The seat seemed narrow enough to fit the sitting pose of the MiniMates, and it seemed to be quite big. It is a whole lot bigger than the 4 Wheeler, and it’s bulk is helped by the rubber wheels. Silver Sable is sitting on the back for cover. It actually works quite well. It is another vehicle that looks good sitting as a prop piece. Luke Cage is riding the HW450F. 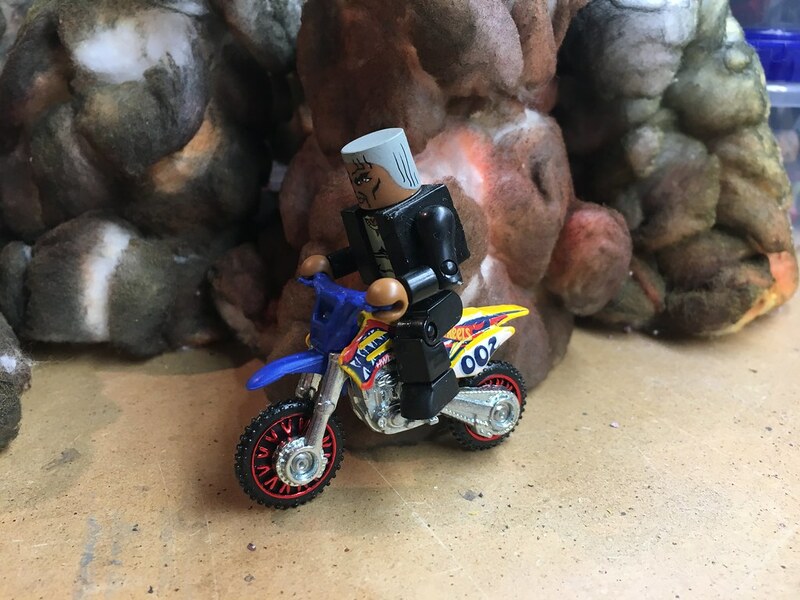 This dirt bike is about as perfect a scale match as you will find with the MiniMates. The only problem is that it cannot stand on it’s own. You will need to find a way to assist the stance. A wire behind would probably do the trick. This was a fun experiment. 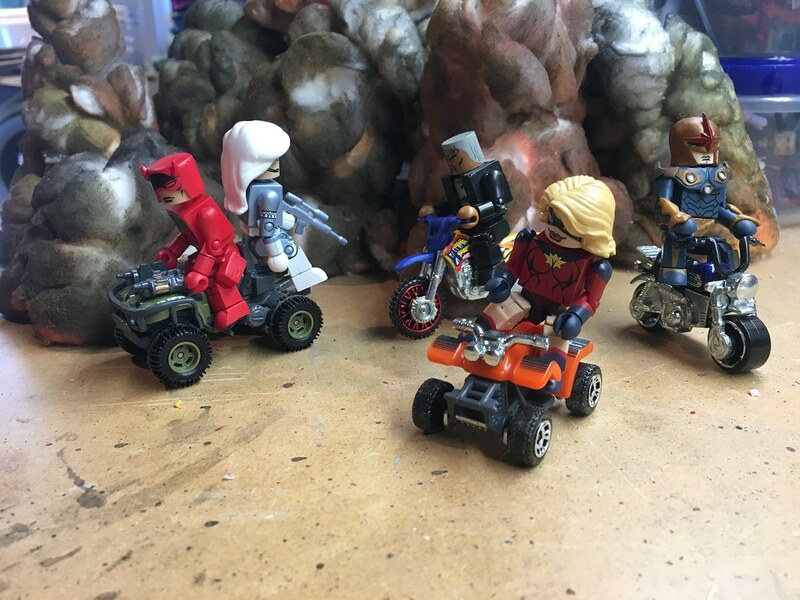 The dirt bike (HW450F) works the best for scale, and at only $1.00 a piece, you can outfit a whole squad for not much money. A bit of paint, and you are good to go. The UNSC Gungoose is a good choice too. They are a bit on the pricey side, since they are a part of the Entertainment series with metal parts are real rubber wheels. I would not expect to see a whole bunch of versions of this vehicle to come out. But the machine guns on the front, and seating for two make for a story all their own. The hunt will continue for the best accessories to find to make dioramas even more dynamic. We will take a look at the ladies of Netflix, Elektra and Jessica Jones. 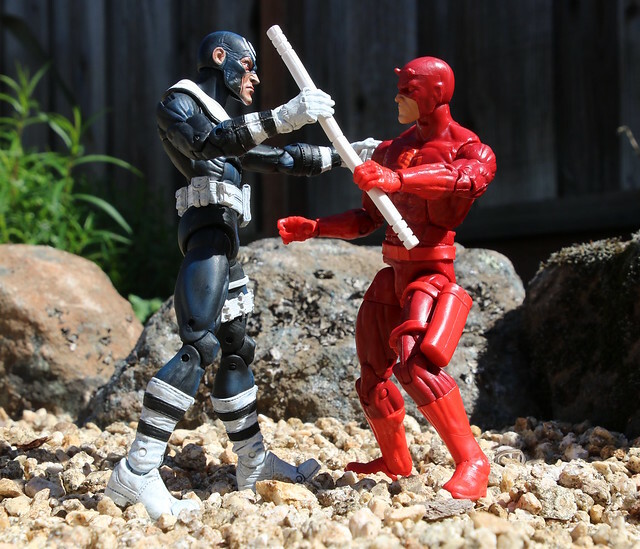 Yesterday we looked at the men of the series, Daredevil and Punisher. These two may be smaller, but they are two very tough ladies. 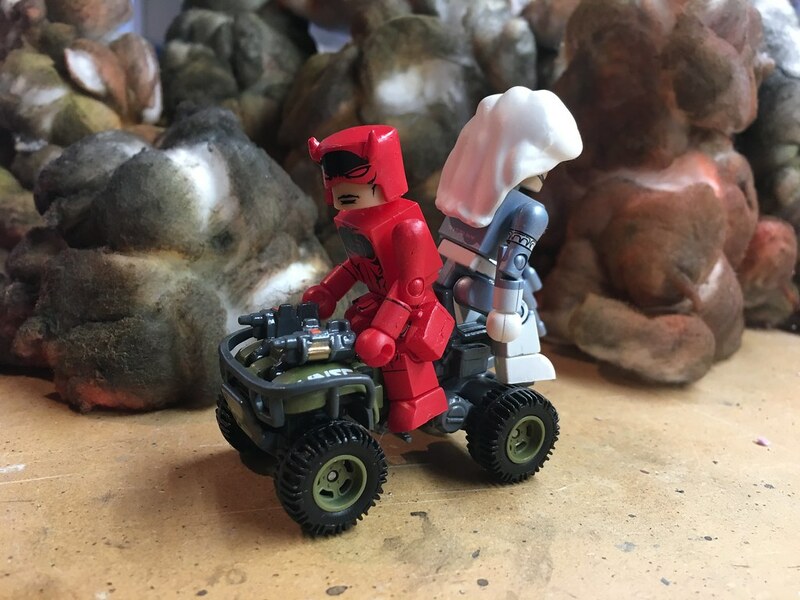 A part of Daredevil Season 2, she came back in Defenders Season 1, to make a nice segway into the later figures we should be seeing from the Defenders team. Elektra comes packaged with a mask covering her face. The black and red looked great on the screen, and it looks good here too. She comes with two sais. The shape of her hands allows her some interesting holding positions for her sais, way better than just holding them straight. We saw her use them in Daredevil Season 2, and they are an important part of her story in The Defenders. She also comes with an unmasked version of her head. It is a very good likeness of Élodie Yung. The movie/TV figures continue to get better and better head sculpts. Now if we can only take care of the shiny skin, we would be all set. Now THAT is a likeness of Krysten Ritter. Boy how I wish the figures weren’t so shiny, but that is a part of the process I guess. There is not a lot going on with the figure. It is great to see some plain clothed figures, and Jessica fits the bill. She is mad about having powers, and is really an anti-hero, who has the role thrust upon her. So of course she mocks the characters who do wear costumes (lookin’ at you Daredevil). The outfit is perfect, with the leather jacket over a black shirt, and the tight jeans down to the boots. She does not come with any accessoires, but other than a liquor bottle or a glass, she doesn’t really have any tools that she uses. I guess they could have given her a camera. Ah, that would have been a great accessory. A camera with a long zoom lens. Boo! Now I am going to have to find or make one for her. This is a great couple of ladies to put out first. Elektra from Daredevil, and Jessica Jones from her own show before going head to head in The Defenders. If there is something that Netflix has done right (and there is a lot that they have done right), it is the great strong female lead characters. I am hoping we will get Karen Page, Claire Temple, and of course, Colleen Wing. So far so good. We have three figures left that are all comic figures. Can the rest of the wave stand up to the great start? We will see. So cool that all 6 figures got their own emblems on their box tops. Today we are going to take a look at the men of the Marvel/Netflix series Daredevil. 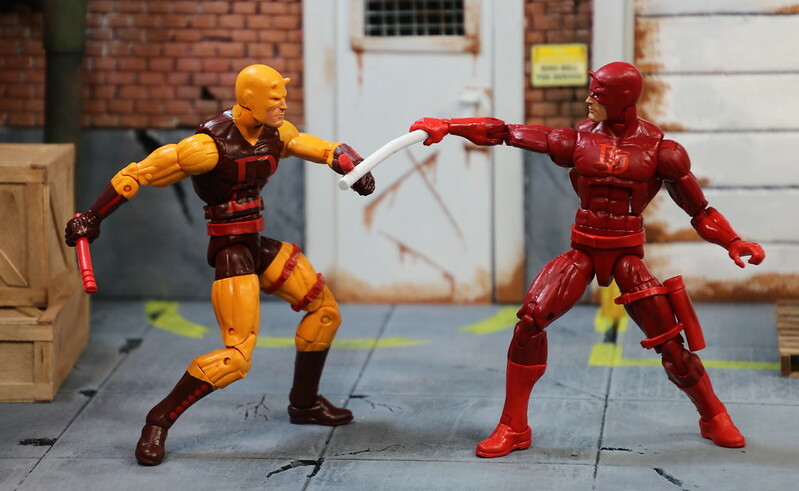 Hasbro is working their way toward giving us the 6 inch versions of the Defenders. They are starting with characters built around Daredevil and expanding from there. That seems only right, as Daredevil was the first and breakout hit of the Netflix attempt at making Marvel shows on a digital platform. And then we were introduced to The Punisher in the second season, which got a lot of hype and his own series. So, we will start with these guys, and then move onto the women of Netflix, before moving on to the comic figures in this wave. I was hooked from the first episode. I HAD to binge watch that show. 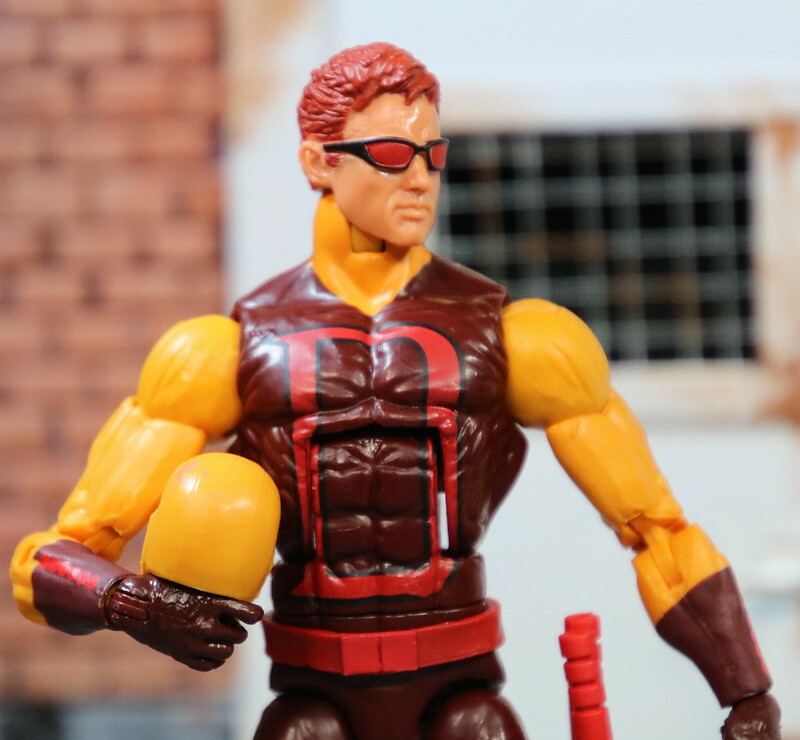 So when it was announced that Hasbro was bringing out Daredevil from the show in the Legends line, I was ecstatic. What we got was just about perfect. The realism that Hasbro has brought to the Legends movie figures carries over here. There are so many small details in the outfit, from the straps, to the textures in the fabrics used. He comes with gripping hands that allow shim to use his billy clubs. He also has a set of fists, which he really needed because he goes around punching people much more than using the baton. The Punisher came around in season 2, and boy did he make a splash. Many knew Jon Bernthal from his time on the early episodes of The Walking Dead. It was going to be a toss-up if people were going to be on his side after being an antagonist on TWD. But he was greeted with open arms. He was like an exposed nerve ending for both the viewer and Matt Murdock. Matt had to come to terms with how similar he was to The Punisher, and had to look internally and decide what he wanted to be as a hero. This figure of Frank Castle comes with a trench coat, and his telltale bulletproof vest painted with the white skull. We saw that chest again at the beginning of Punisher Season 1, before he sheds if for most of the season, thinking that his time of being The Punisher was over. The vest will return, but not the overcoat. Hasbro did a really good job with the likeness of Jon Bernthal, from the haircut to the 5 o’clock shadow. He even looks pretty banged up, which is how he seems to spend his life now. He comes with two guns, a black assault rifle with grenade launcher, and a silver 45. The rifle needs a strap, and the handgun needs a holster, but other than that, nice weapons to add to his arsonal. I am very happy with the first two figures in the Netflix series. Up next we will look at the women. They turned out equally as good. We are going into the Way-Back Machine here. 2005 to be more precise. 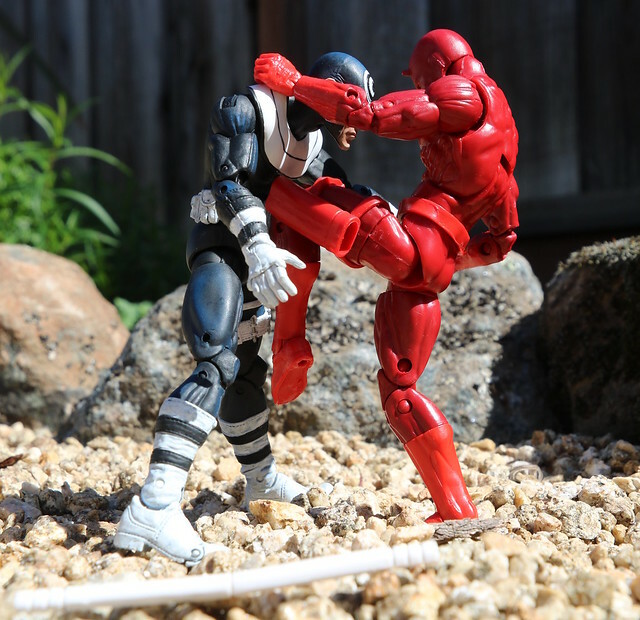 Toy Biz was the company, and big articulation was their game. They focused on giving us good figures with lots of articulation, and some extra paint. Most of the time what they gave us was brilliant. They had some things to work through along the way, like the ball jointed hips that really stood out as strange and weird. That is when function won over form, and hurt the overall look. They also went with super articulation in the hands and gave us articulated fingers. Now, for grasping, that was quite fantastic. Making a fist is a lot harder with straight fingers. You get guys who look like they have never thrown a punch before. 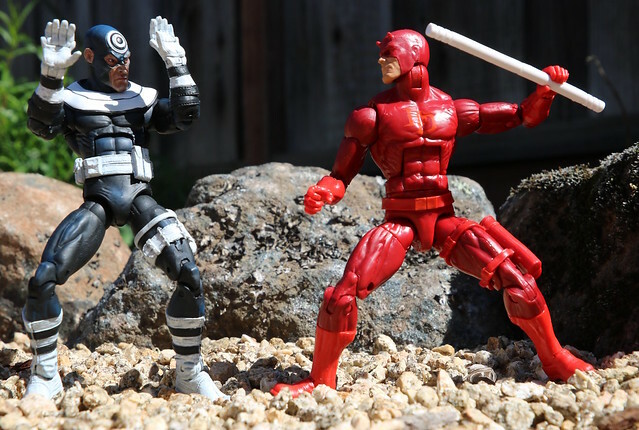 Bullseye came across my radar, and since I wasn’t really collecting Marvel Legends at the time, except for getting all of the parts to the most awesome BAF of all time, the Sentinel. I figured with a couple of great Daredevils that came out at the end of last year, it would be good to have a Bullseye for him to fight. Overall I like this guy. He is well artuculated as he should be. He has great paint apps that help to tone down the white. I really like all of the pockets and pouches he has all over the place. It adds a lot to the outfit. I don’t know how many parts of Galactus I am going to end up collecting for this one. The prices for this very first BAF series is up there pretty high. Who would have guessed that Walgreens would have really stepped up their game with some Marvel Legends Exclusives? First we had Ant-Man, and now we have the really well colored first appearance of Daredevil. This guy has been blowing up the toy sites, first with the surprise that he was being offered at Walgreens, and then that he would look so good. 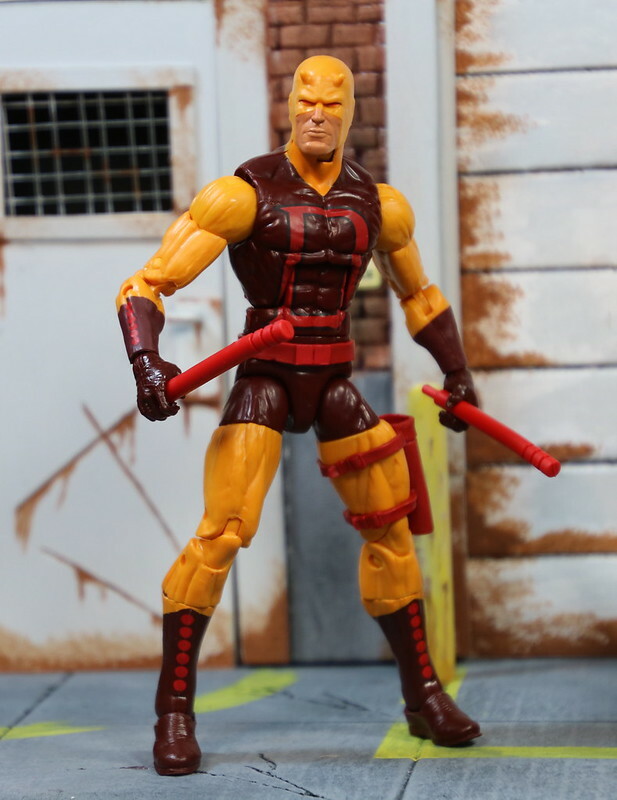 He is a repaint of the recent release of Daredevil in his modern outfit. Really, the big difference is in the paint. It is amazing how they could repaint the guy, and have him look so different. 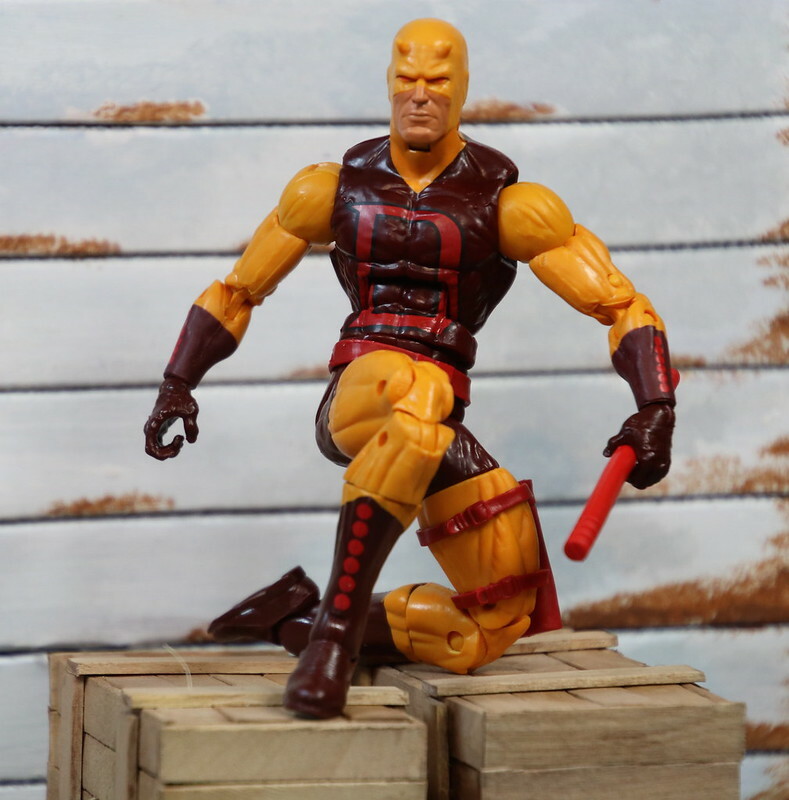 He comes with his batons, this time in red, and this time in a much stiffer plastic than the horrid rubber the last Daredevil had to run around with. He also comes with an alternate head, which is totally awesome. I have already seen people popping the head on the Chameleon body. Guess Hasbro did a good job here. 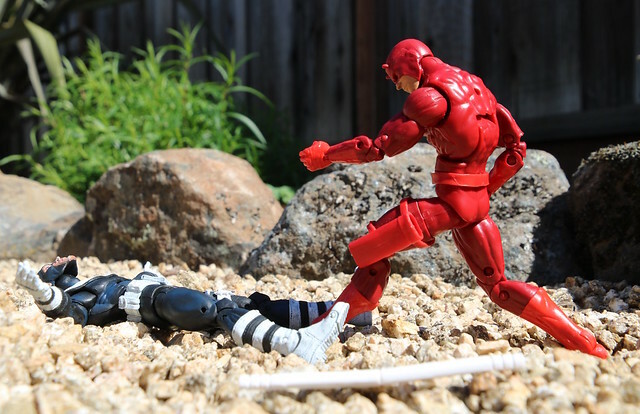 People are going out to buy a second or third Chameleon body so they can have Matt Murdock running around the streets. Then all they have to do is fabricate a cane. Overall a fantastic figure. A great addition to any Marvel Legends collector’s shelf. 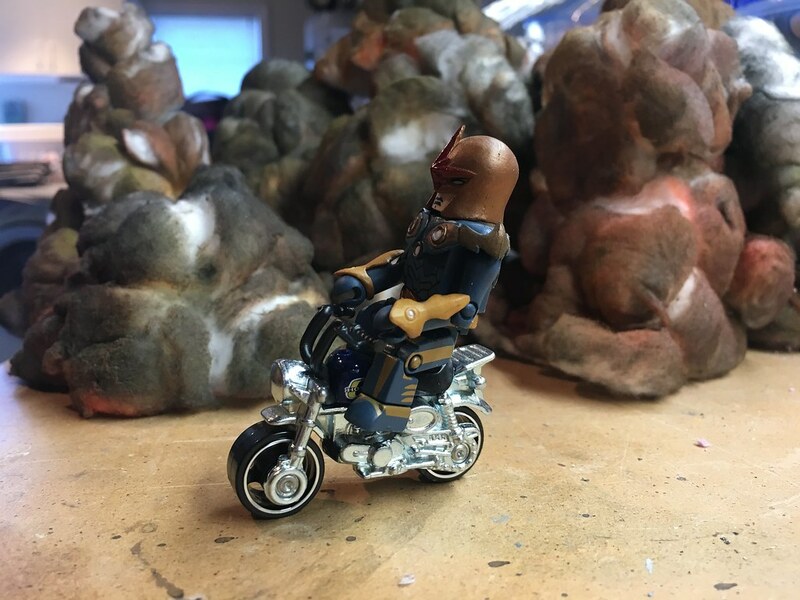 Continuing my biggest photo shoot ever, I bring you the Marvel Legends Hobgoblin Wave. As you might suspect, this wave is all about Spider-Man and family. Another seven figures, and two more women. This one was easy for them, as there are lots of great women in the Spider-verse to choose from. Since Felicia Hardy is already out there, and looking mighty fine, they went with a few others. Let’s go! He looks great in his classic costume. 4 extra hands, a mask up head, and a slice of pizza. He comes with HG’s leg. This is as classic as you can get with Spider-Man. He looks amazing. This is the perfect body for him. Thin and very highly articulated. He can be put into so many great poses. All of the different hands really lend themselves to allowing Spider-Man to be put into so many different poses and situations. A smile and a slice. Nothing makes a New Yorker happier than a skinny slice of pizza. No accessories with Anti-Venom, but then what would you give him? He is a one symbiote wrecking crew. Just HG’s leg. I didn’t like this style from back when we got Toxin last year, but he was needed for the leg of Hobgoblin. I do actually like AV better than Toxin, since he has a better head, and looks better overall. I do love the giant hands. SM2099 doesn’t need anything special to fight with either. Really, none of the Spider-Family really needs any accessories, but it is a bit sad when they come alone. HG’s arm and flaming sword. Spider-Man 2099 looks great. The paint is fantastic. There is a bit of glitter in the blue plastic to give him a bit of a shine. Ending up a little more spider than Spider-Man, this guy looks mean. He has his clawed fingers. Spider-Girl, the second in two years, looks a lot more like her father in terms of attire. This version is Mayday Parker as opposed to the first version (in the Green Goblin series) that was Anya Corazon. She comes with HG’s head and wings. Spider-Girl has some great details on her personage. She carries the larger web shooters on her hands. She is not quite as well articulated as her father. Hasbro seems to still have some issues with making good articulation on the slight build of their women. That is a great face, reminiscent of her father’s sult. Ultimate Spider-Woman. She comes with HG’s Torso. It’s Jessica Drew, but not really. In the next wave, we get the real Spider-Woman, but this time around we are going Ultimate, which means taking what we know and turning it on it’s head. This Jessica is the clone of Peter Parker. Boy, Peter sure does seem to have a lot of clones. Spider-Woman has wind-swept hair, which actually pulls her off to that side on her slight body. The paint on this one is okay, but a little boring. She kind of gets lost in the crowd of bright reds and blues this time around. The one everyone has been looking for. Since the NetFlix show came on, Daredevil’s popularity has continued to rise. I couldn’t find him in any stores, but I was not going to pay scalper prices online, so I just waited for the time to strike, and finally got him on Amazon on a day when the prices dropped to normal. He comes with his sticks that can be combined to form a staff. He also comes with HG’s arm. The rest of this wave of heroes are fairly slight in build. They are what you would expect from Spider-People. Matt is a completely different body type. Taller and more of a brawler. I love how his muscles are so well defined under his costume. He carries his two sticks. He can hold one in heach hand, or they can be stored in the holster on his left leg. Put those sticks together, and he has a bit of a longer reach with his staff. Usually the BAF is THE ONE you are waiting for. None of these three waves are BAF’s I have been waiting to get my hands on, so getting the figures finished was not that great for me. Not like when I finished the Sentinel, Groot, or the upcoming Hulkbuster Armor. We had the Green Goblin last year, so why not Hobgoblin this year? Quite a different figure from the last. This one is yet another slight of build Spider-Man figure. He comes with his flaming sword, a flaming pumpkin bomb, and his wings. The wings have the hilt of his sword that can be removed. He is SO ugly. Just the way he should be. He has some really strange body design parts that really make him an interesting figure. If you like Spider-Man, this is the wave for you. We get the best version of Spider-Man to date, along with some great supporting cast members. 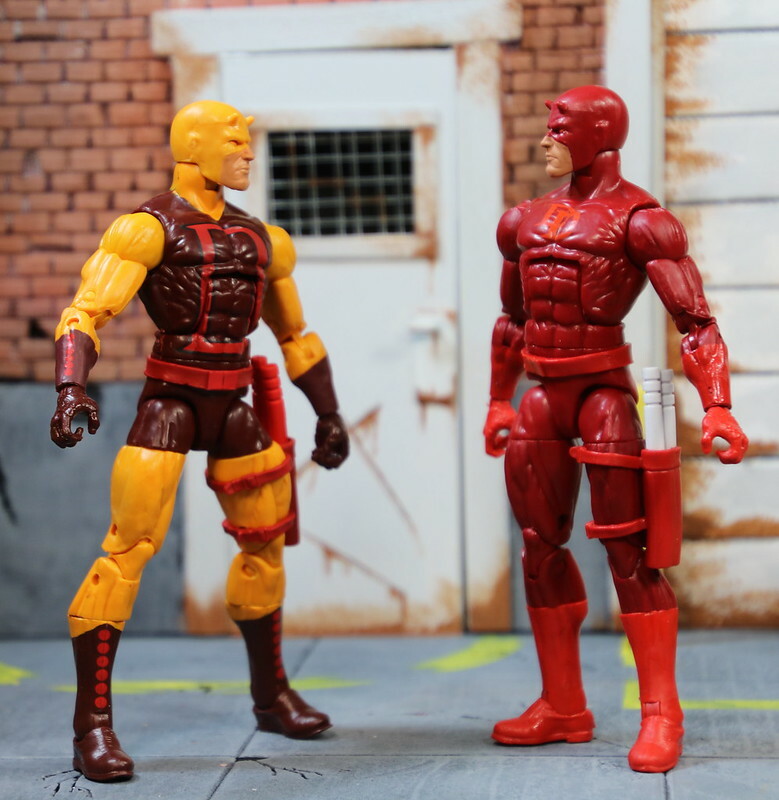 Daredevil of course is a must have for the Marvel Legends collectors. The rest are give and take. I really like the design of SM2099 and Spider-Girl. Anti-Venom is so-so, but better than the earlier Toxin. I am not a big fan of the Spider-Woman. She is very slight of build, with a heavy head. Especially since we get the best version of Spider-Woman in the Thanos Wave coming up next.